Today's increasing use of Mobile and Tablets by the common people enforce us to give access of your MLM business concepts on Mobile and Tablets. If you are looking for a Mobile App development company which develop Mobile Applications for MLM Business Management; MLM Software India - world's leading MLM Mobile Application development Company which is committed to provide customized MLM Mobile Apps through which you can facilitate your MLM business users to review their MLM business growth on Mobiles or Tablets inclusing iPhone, Android or BlackBerry. Grow your MLM business among maximum number of people through MLM Mobile Apps by developing Android or iPhone MLM Mobile App through our expert Mobile App developers. MLM Software India develops customized MLM Mobile Application on Android and iPhone platform. Share your MLM business Mobile application requirements with us and our expert MLM Mobile App developer team will exactly develops the same. Boost your MLM business by providing MLM Mobile Application to your MLM business affiliates and promoters thought they can access their user account through their own Mobile or Tablet. Our MLM Mobile Apps are easy to download, install and navigate, small in size, professional screens. 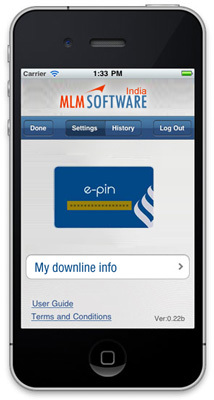 Though, grow your MLM business with our featured MLM Mobile Apps now. Also customers can view their incentives, payments, downlines, e-wallet statements and even register new members. This our MLM Mobile app is the new companion for a MLM Business.